The Legends is a group of five golf courses, three of which (Heathland, Parkland, and Moreland), are located off Rt 501 in central Myrtle Beach. Heritage (Pawleys Island), and Oyster Bay (Sunset Beach, North Carolina), round out the group and all have been operated by the Arnold Palmer Golf Management group since 2009. 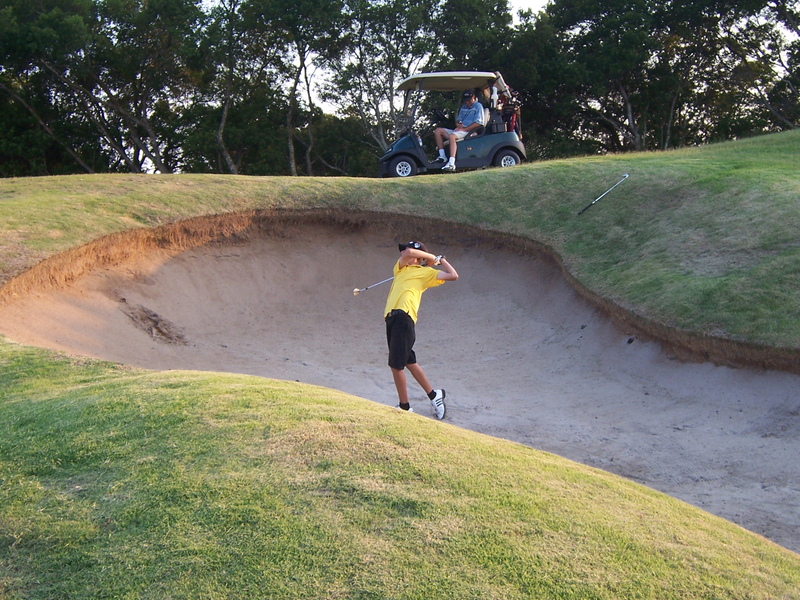 Recently our group played all five courses in late May – early June of 2011. This review covers Heathland, Parkland, and Moreland. The Legends is an excellent value when coupled with the readily available “Three Round Special” package that includes daily lodging, greens fees for one round per day, carts, range balls, breakfast, lunch, and two drinks. Our group played on a package that included Heritage and Oyster Bay and found that the excellent course conditions and the professional staff’s ability to move several hundred golfers a day and pay special attention to each made the golf experience very cost effective. Along with three superb championship courses, the Rt 501 facility includes an extensive grass driving range and short game practice area. Each course presents a stern test and is very different in layout, but each are equally playable and enjoyable. All three are very well marked and a free yardage guide is provided in each golf cart. Heathland is a wide open links style layout with large bunkers and undulating greens providing the main challenge. Parkland is a traditional tree-lined layout with large fairways and is the longest of the three. Moreland is a P.B. Dye design and provides several elevation changes and significant greenside mounding as well as routing around water hazards that creates an ample test of a player’s shot making ability. Conditions were consistent across all three courses with closely manicured fairways, very undulated greens that ran smooth and true, and consistent sand in the vast array of deep faced bunkers. Several of the tee boxes were a bit patchy and slightly burned out but did not affect playability. Driving range conditions were equally impressive as the all grass hitting areas were rotated to ensure even ware and recovery. Considering the large number of players and long hours (open under the lights until 9:00 p.m.), we always had good grass to practice from. A large undulating practice putting green with room for 20 + holes was available and closely mirrored course conditions. Putting green markers are used in lieu of actual cups, which is an inconvenience for players who prefer putting to an actual hole. Shuttles constantly move players and equipment from the staging areas to and from the driving range since the walk is considerable. Shuttle service was also available to transport golfers to and from the golf facilities and their housing units. The professionalism on display from the golf shop staff, food service staff in the clubhouse, beverage service on the golf course, range attendants, and shuttle drivers was unparalleled. From the little details like fresh towels and coolers with ice in every golf cart to the television screens showing scheduled tee times for all three courses in the clubhouse, our group definitely noticed a marked improvement in friendliness and attention to detail. Everyone went out of their way to accommodate our every need and when a tournament was mistakenly scheduled over our previously reserved tee times on Heathland, the shop staff handled the mix-up calmly and professionally and got us out on Parkland in the same time slots and even compensated us with half price replay rates for the balance of our stay, which was greatly appreciated. You get the feeling the customer is truly appreciated. The Arnold Palmer Golf Management group has done the job. Avid sports fan and golf nut. I am a lifelong resident of the Washington D.C. area and love to follow the local teams. Also worked as a golf professional in the Middle Atlantic PGA for several years and am intrigued by the game to no end. I love to play and practice and am dedicated to continual improvement. This entry was posted in Course Reviews, Myrtle Beach, Travel and tagged course review, Golf, Myrtle Beach, sports, The Legends, travel. Bookmark the permalink. Great review of the Legends. I have a question for you though. I am heading there for my stag in March. Are the Legends courses BYOB? Not looking to get hammered on the course or anything, just looking to fill a cooler with some bud lights for the round. If it is not BYOB, what are the prices for beers? I have researched everywhere on the net and cant find anything written on this. Let me know and thanks in advance. The Legends did provide beverage service on the course which included alcohol however each golf cart is equipped with a small cooler filled with ice. Could probably hold a six pack without the ice and about four cans with. The organization doesn’t discourage you from BYOB so take your own. I’m unsure of the beverage prices. Let me know if you have any other questions about The Legends group. I’ve played all the courses as well as Heritage and Oyster Bay on several occasions. Have a great stag and enjoy the golf! Played Heathland three times. Course was in excellent condition from tee to green. Greens were putting medium to fast and rolling true. Played Moorland once. Tee boxes were all chewed up and aerated. Greens were in good condition but were putting much slower than Heathland. 9:00 tee time on Saturday – round took 6 hours to play.. Note: If you want to play The Legends courses, best to do it during the week and avoid the weekend crowds. If you have to play the weekend, get an early tee time. Parkland was aerated W2W and we did not play it.